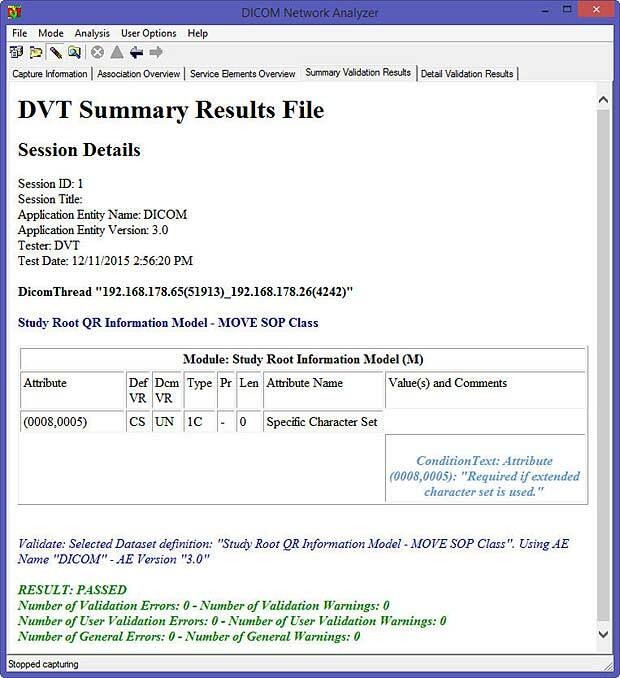 DVTk is an Open Source project for testing, validating and diagnosing communication protocols and scenarios in medical environments. It supports DICOM and IHE integration profiles. The project started in 1997 by Philips and was joined by Agfa in 2001. In 2005, DVTk was open sourced and one year later ICT Automatisering joined the open source community. in 2009 Agfa left the project. DEFINITION "Digital X-Ray Image Storage - For Presentation.def"
DEFINITION "Digital X-Ray Image Storage - For Processing.def"
DEFINITION "Enhanced CT Image Storage.def"
DEFINITION "Enhanced MR Image Storage.def"
Scripts are saved as text files with the extension .ses. 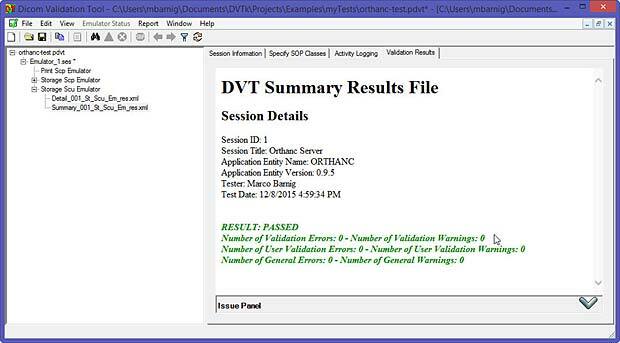 Several scripts can be referenced in an xml-project file with the extension .pdvt. The next figure shows the results of the DVTk network sniffer analyzing the DICOM traffic between the OSIRIX HD viewer on iPad with the ORTHANC DICOM server (version 0.9.6) running on Window 8.1. The C-MOVE communication works without errors and the received results displayed in Osirix HD are correct. The Orthanc server shows no specific error message in the command window. The next example shows the case of a failed communication. The C-FIND query sent by the PACS DICOM iPad app to the Orthanc server (version 0.9.6) is aborted with a DIMSE failure. The query is identical to the C-FIND request sent by Osirix HD. The Orthanc log signals “DIMSE No data available (timeout in none-blocking mode)”. 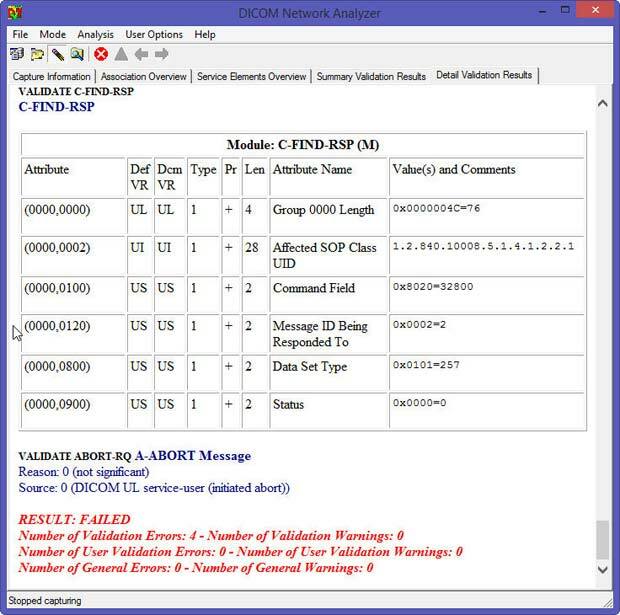 The DVTk network analyzer shows the same four errors as in the case of the Osirix communication. After a timeout, the communication is aborted. A deeper analysis is required to identify the reason of the abort request. If the problem is caused by a non-valid parameter in the C-FIND query, the recently proposed LUA script filter will be an excellent remedy. A local area network (LAN) is a computer network that interconnects computers within a limited area such as a residence, school, laboratory, or office building. It is contrasted to a wide area network (WAN), which covers a larger geographic distance and may involve leased telecommunication circuits. Ethernet over twisted pair cabling and Wi-Fi (WLAN) are the two most common transmission technologies in use for local area networks. The term Virtual Host refers to the practice of running more than one website (such as dev.radiologic.fr and local.radiologic.fr) on a single machine. The fact that they are running on the same physical server is not apparent to the end user. Apache was one of the first servers to support virtual hosts right out of the box. Domain names are used to identify one or more IP addresses. They are used in URLs to identify particular web pages. Domain names can be local or public. The latter must be registered with an ICANN accredited registrar. A domain name consists of one or more parts, technically called labels, that are conventionally concatenated, and delimited by dots, such as example.com. The right-most label conveys the top-level domain (TLD), including the generic top-level domains (gTLDs), such as the prominent domains com, info, net, edu, and org, and the country code top-level domains (ccTLDs) such as lu, de, fr. Below the top-level domains in the domain name hierarchy are the second-level domain (SLD) names. These are the names directly to the left of the top-level domains. Second-level domain names are usually created based on the name of a company, product or service. There can be additional sub-level domains with virtually no limitation. Below these levels, the most right domain name component is used to designate a particular host server, for example www for a world wide web server, ftp for an FTP server, or any other label. A domain name with TLD, SLD and hostname is called a fully qualified domain name (FQDN), for example dev.radiologic.fr. Local domain names used in local networks can be freely chosen by the network administrator, but some TLD’s should be avoided. For example Apple uses the domain extension .local for it’s implementation of zero-configuration networking called Bonjour. To map domain names to IP addresses, a Domain Name System (DNS) is used. An IP Address (Internet Protocol address) is a numerical label assigned to each device participating in a computer network that uses the Internet Protocol for communication. The designers of the Internet Protocol defined an IP address as a 32-bit number (IPv4) which is still in use today. A new version of IP (IPv6), using 128 bits for the address was developed in 1995 to avoid a depletion of the available addresses. Its deployment has been ongoing since the mid-2000s. An IP address is logically recognized as consisting of two parts: the network prefix and the host identifier, or interface identifier (IPv6). The routing prefix is expressed in CIDR (Classless Inter-Domain Routing) notation. It is written as the first address of a network, followed by a slash character (/), and ending with the bit-length of the prefix. For example, 192.168.1.0/24 is the IPV4 prefix starting at the given address, having 24 bits allocated for the network prefix, and the remaining 8 bits reserved for host addressing. In IPV6, the reserved address blocks for private networks are referred to as unique local addresses (ULA) and they use the routing prefix fc00::/7. IP addresses can be static (fix) or dynamic. Static IP addresses are manually assigned to a computer by the network administrator. Dynamic IP addresses are assigned either by a server (router) using Dynamic Host Configuration Protocol (DHCP) or by the computer itself, as in Zeroconf. In the last case of address autoconfiguration (link-local address) the address block 169.254.0.0/16 is reserved in IPv4 networks and the block fe80::/10 in IPV6 networks. In IPV4 a subnet mask is used to indicate how the IP address is divided into network and host parts. A subnet mask is made by setting network bits to all “1”s and setting host bits to all “0”s. For example, 255.255.255.0 is the network mask for the 192.168.1.0/24 prefix. Unicast is the dominant form of message delivery on the Internet. The main job of a DNS server is to store DNS name data and serve it when it receives requests. The main job of a DNS resolver is to transform a DNS name into an IP address, but this is only one of several types of resolution services performed by DNS. The process to resolve an hostname to an ip address is normally called dns lookup. Reverse DNS lookup or reverse DNS resolution (rDNS) is the determination of a domain name that is associated with a given IP address. There are different ways that local websites can be viewed from other computers which are connected within the same LAN. These computers can be desktops or laptops running Windows, Mac OSX, Linux or be mobile devices like tablets (iPad, Samsung, …) or smart phones (iPhone, Android, …). We are analyzing now what solution to adapt for a real network case, related to the specific RadioLogic project. If possible, the IT consumerization policy BYOD (Bring your own device) is promoted allowing the radiologists in residence to use their own devices. The local server is a MacBookAir laptop running OSX Yosemite 10.10.5 or later. The clients are iPads running iOS 8.1.4 or later. Both the server and the clients will be used for other purposes. The following figure shows the four operational modes. The project requirement is that the same host names are used in each operation mode to access the three websites. Let’s examine how to achieve this goal. The default values are the IP addresses for the localhost in IPV4 and IPV6 and the broadcasthost for IPV4. The radiologic hosts have been added. Accessing the public website www.radiologic.fr is now possible and the preceding loopback solution is also working. 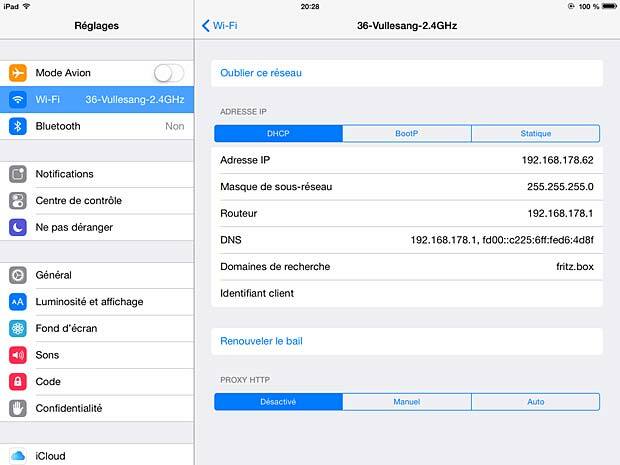 There is no problem to access the public website www.radiologic.fr, but the simple loopback solution to access the local hosts is not possible on mobile devices without jailbreaking. The next possibility consists in using a local DNS server. 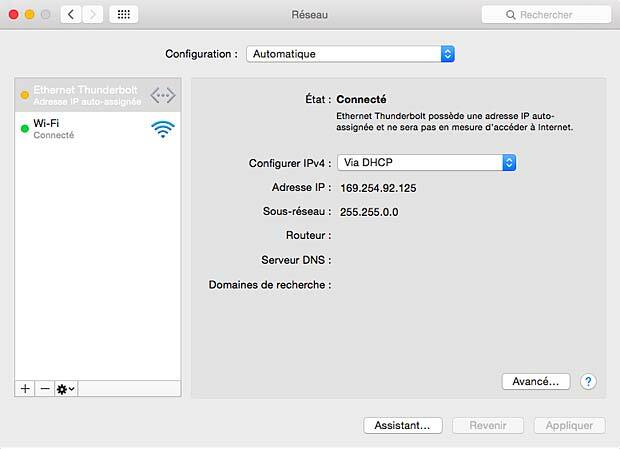 Setting up a DNS server on the Mac laptop with primary zones for the local hosts needs a parameter change in the DNS configuration of the iPad Wi-Fi connection. I recommend to never change the network parameters assigned by the Internet provider on your router and local devices to avoid all sort of problems. There exist a third solution to access the local hosts in our case, which some developers consider as a hack : using the public DNS server to point towards the internal private IP address of the Mac computer. This solution is simple and feasible in our case because all hosts use the same domain name radiologic.fr which is registered and managed in a public DNS server. Instead of creating an A record for both dev.radiologic.fr and local.radiologic.fr we can use a wild-card (*) to catch all DNS records. I don’t agree with these arguments that I consider as minor problems or not applicable in specific cases. I think the solution is not a such bad idea in practice and I will use it in the RadioLogic project. Some routers provide a security feature to protect against DNS rebinding attacks by suppressing DNS responses that refer to IP addresses in the home network. My router FRITZ!Box 7390 is such a device. It allows to enter domain names in a list of exceptions where this protection should be disabled. In our case these are dev.radiologic.fr and local.radiologic.fr. In iOS and OSX Wi-fi settings, each Wi-fi connection has a Search Domains section which is simply a convenience that allows the system to convert host names to Fully Qualified Domain Names (FQDN). Anyplace you might use a FQDN, such as in the location bar of Safari, you can use a simple host name. If the system can’t resolve that host name to an IP address, then it will try appending the search domain to the host name and try again. If you specified more than one search domain, it will try them each in order. 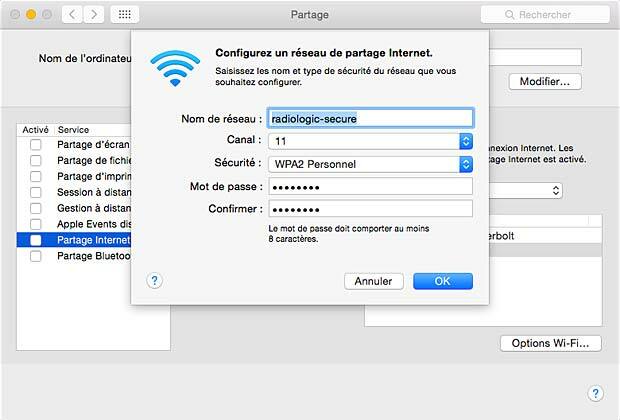 If we set the search domain to radiologic.fr, we can use the host names dev and local to access the corresponding websites. I didn’t opt for this solution because it introduces more complexity and an additional delay in setting up connections. Sometimes it’s useful to create a WLAN (wireless network) between two or more Wi-Fi-enabled computers without using an Wi-Fi router. These computer-to-computer networks are usually referred to as AdHoc wireless networks. On a Mac OSX (Yosemite 10.10.5) it’s easy to set up such a network. 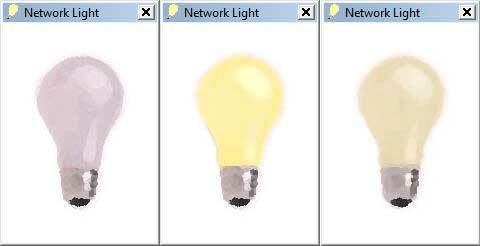 Choose Create Network from the Wi-Fi status icon in the menu bar. 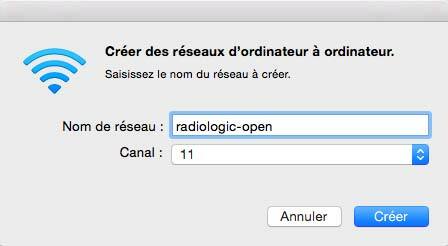 Enter a name (in my case : radiologic-open) for the new network and select the channel (default channel = 11). You will notice that there is no password protection to secure the network. A WEP (Wired Equivalent Encryption) algorithm was however available in previous versions of the OSX system. WEP was Wi-Fi’s first encryption standard and was almost intentionally designed to be weak due to issues related to the US export policies about encryption. WEP was deprecated in 2003 and replaced by WPA2 (Wi-Fi Protected Access) by the Wi-Fi Alliance. In Yosemite, Apple killed WEP once for all, without replacing it by another protection method in AdHoc mode. 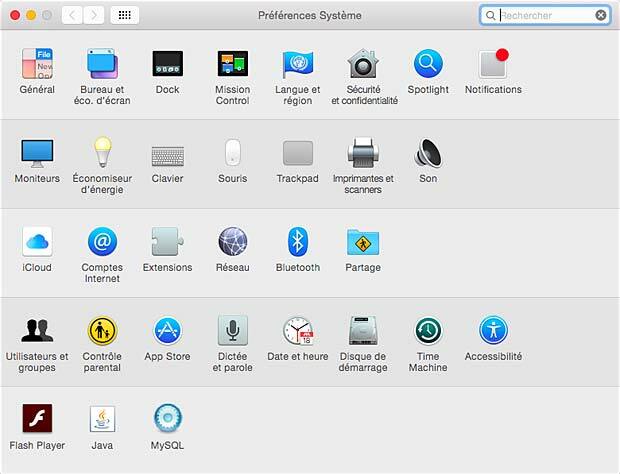 If the icon isn’t in the menu bar, choose Apple menu > System Preferences, then click Network (réseau). 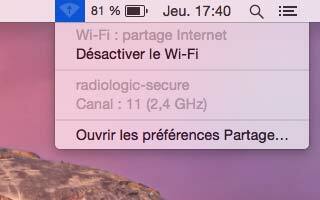 Click Wi-Fi and select the Show Wi-Fi status in menu bar checkbox. 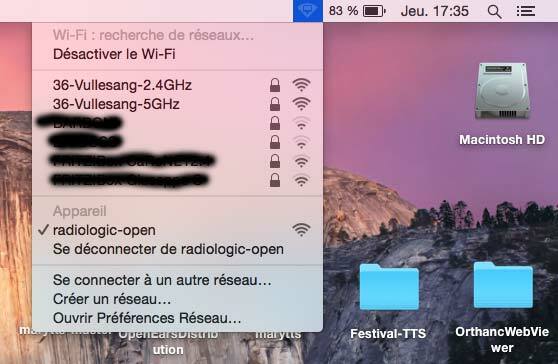 The Wi-Fi status menu shows the established connection with the radiologic-open network. The menu allows an easy logout and reconnection to another Wi-Fi network. An automatic logout occurs when the Mac screen is powered off. 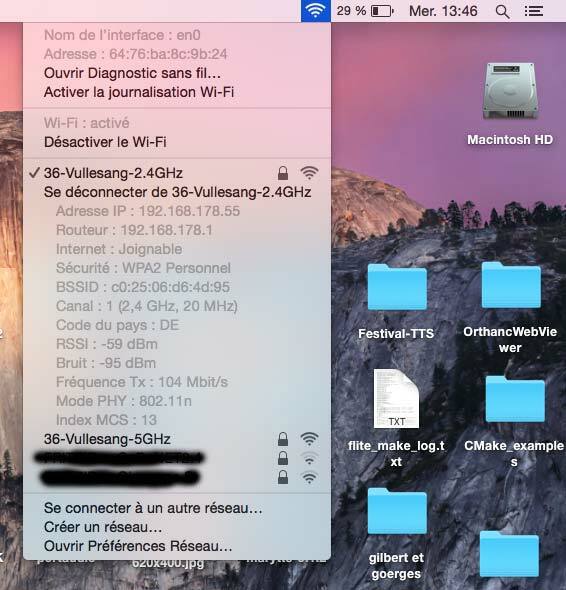 There exist a second possibility to set up a Wi-Fi network on Mac OSX. The computer is configured as a software Wi-Fi base station. This allows to share an Internet connection and offers a password protection, but it has another inconvenience. 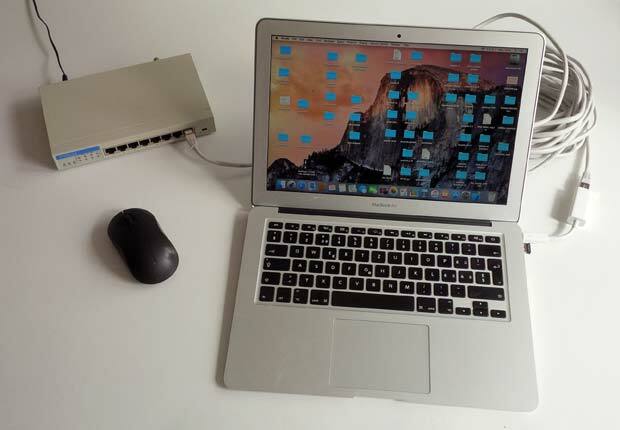 You need a working wired Ethernet connection between your Mac and a hub, even if the hub is not connected to the Internet. The next picture shows my test setup: my MacBookAir is connected via a Ethernet-Thunderbolt interface to an ancient 10 Mbit/s Ethernet hub. 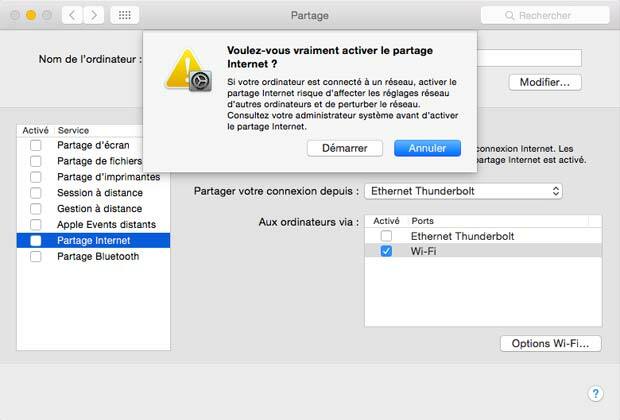 First you need to configure the Ethernet-Thunderbold interface. 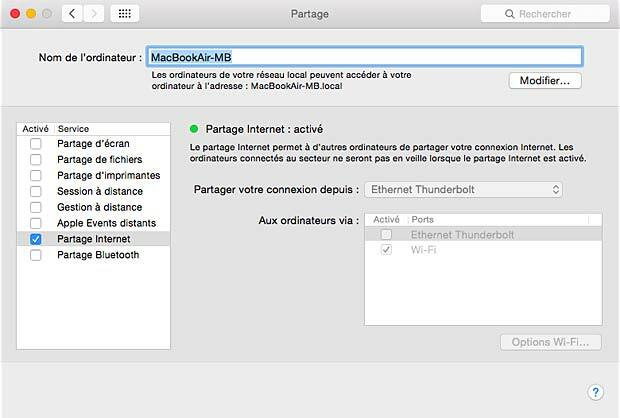 Go to Network in System Preferences and select the automatic configuration. The interface gets a self-assigned IP address in the range 169.254.x.x. In the next step go to the Sharing Preference Pane in the System Preferences. Select Ethernet-Thunderbold as source port and Wi-Fi as destination port. 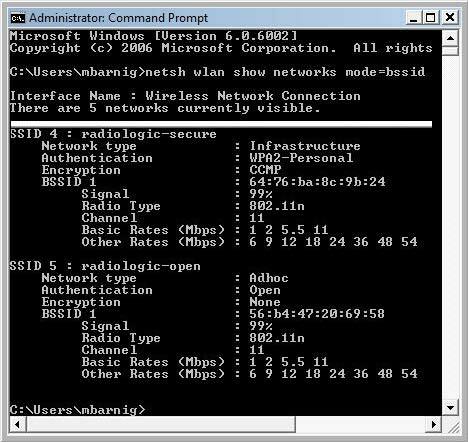 Select Wi-Fi options to enter a name (in my case : radiologic-secure) of the network, to select a channel and to define a password (minimum 8 characters; numbers are not recognized on BlackBerry and Android). Finally check the Internet sharing checkbox and confirm the settings to activate the connection. The resulting pane is shown below. The Wi-Fi status is updated automatically. To log out, desactivate the Wi-Fi connection in the corresponding menu. An automatic logout occurs when the Mac screen is powered off. The following table shows which of my devices are capable to connect to the Mac OSX AdHoc and Infrastructure networks. 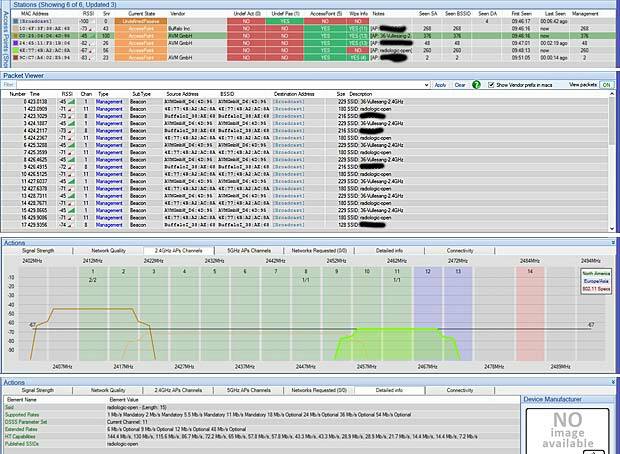 To detect the reasons why some devices don’t connect to the Mac OSX Wi-Fi AdHoc or Infrastructure networks, you can use a WLAN analyser. 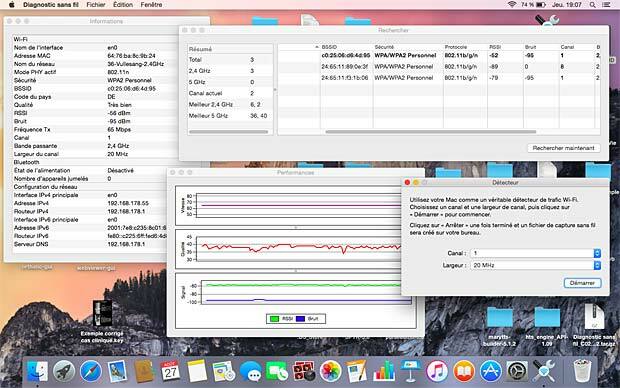 Mac OS X Yosemite has an in-built Wi-Fi scanner to help you find the best Wi-Fi channel. When you hold down the option key ⌥ (next to the CTRL key) and select the Wi-Fi icon in the menu bar, a secret dropdown menu opens. Open Wireless Diagnostics and click it. After you have gotten to the page and have opened up the Wireless Diagnostics window, go to the top left of your menu bar and click on Window where you find several options: Informations, history, scan, performance, detection, … Some results are shown below. 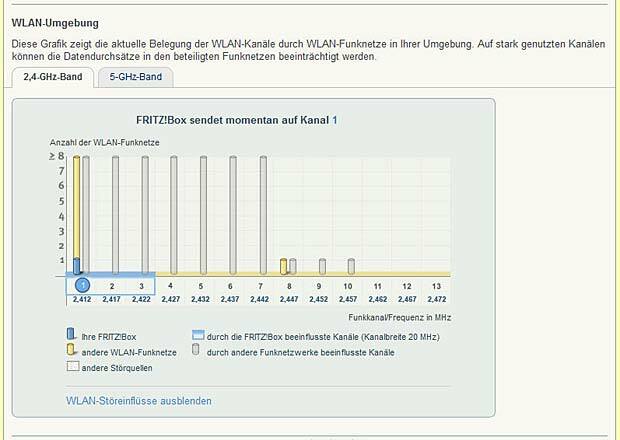 A third WLAN tool is integrated in my Wi-Fi router FritzBox 7390. Various wireless networks in my neighborhood are shown, but nor the channels used by the Mac OSX nor the names of these networks are listed. I don’t know why ? The following list shows links to websites providing additional informations about Wi-Fi networks, related to Mac OSX. Volunteer computing is an arrangement in which people (volunteers) provide computing resources to projects which use the resources to do distributed computing and/or storage. Distributed computing is a field of computer science that studies distributed systems. A distributed system is a software system in which components, located on networked computers, communicate and coordinate their actions by passing messages. Neural networks are very good candidates for simulation by distributed computing systems because of their inherent parallelism and beacuse its simulation is a very time consuming process, due to the complex iterative process involved. The first volunteer computing project was the Great Internet Mersenne Prime Search, which was started in January 1996. The term volunteer computing was coined by Luis F. G. Sarmenta, the developer of Bayanihan. The Berkeley Open Infrastructure for Network Computing (BOINC) is the most widely-used middleware system for volunteer computing. It offers client software for Windows, Mac OS X, Linux, and other Unix variants. The project was founded at the University of California, Berkeley Space Sciences Laboratory, funded by the National Science Foundation. Other systems are XtremWeb, Xgrid and Grid MP. An oEmbed exchange occurs between a consumer and a provider. A consumer wishes to show an embedded representation of a third party resource on their own web site, such as a photo or an embedded video. A provider implements the oEmbed API to allow consumers to fetch that representation. The response returned by the provider can be in either JSON or XML. The authors of oEmbed are Cal Henderson, Mike Malone, Leah Culver and Richard Crowley. Among the providers of oEmbed are Youtube, Flickr, Vimeo, WordPress and Slideshare. Universal Plug and Play (UPnP) is a set of networking protocols that permits networked devices, such as personal computers, printers, gateways, servers and mobile devices to seamlessly discover each other’s presence on the network and establish functional network services for data sharing, communications, and entertainment. UPnP is intended primarily for residential networks. No special device driver support is necessary, common network protocols are used (TCP/IP, HTTP, XML, SOAP). UPnP uses UDP port 1900 and TCP port 2869. The UPnP technology is promoted by the UPnP Forum. Formed in October 1999, the UPnP Forum is an industry initiative of more than 1000 leading companies in computing, printing, networking, consumer electronics and home appliances. A huge library of UPnP resources is available at the website of the UPnP Forum. UPnP was published as an international standard, ISO/IEC 29341, in December 2008. The foundation for UPnP networking is IP addressing, either by DHCP or by AutoIP (zero configuration networking). The next step in UPnP networking is discovery, based on the Simple Service Discovery Protocol (SSDP). 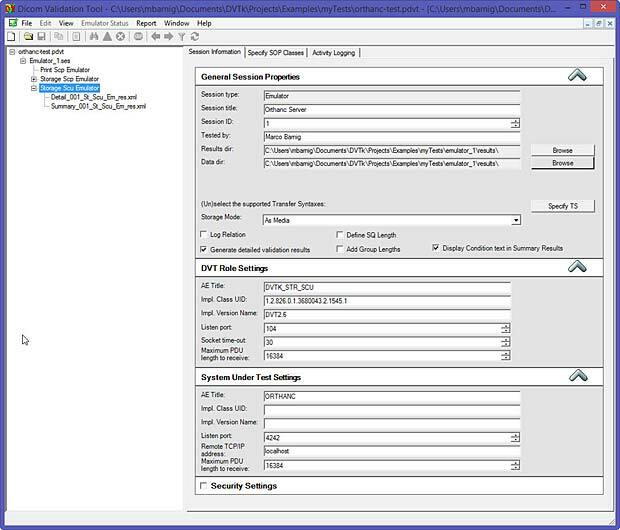 SSDP allows a device to advertise its services to control points, for example to media servers (Serviio) on the network. 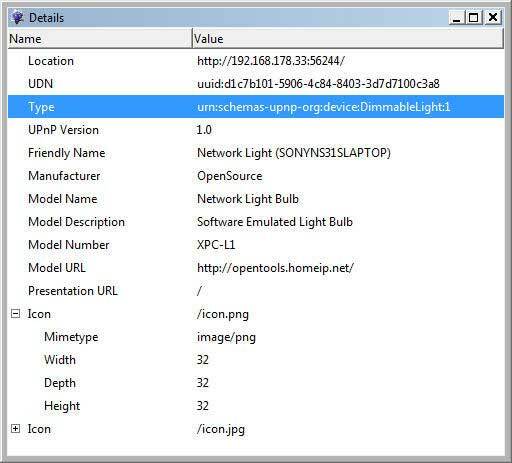 The next step is to learn more about the discovered device and its capabilities by retrieving the device’s XML description from the URL provided by the device in the discovery message. Now the control point can send actions to a device’s service using the Simple Object Access Protocol (SOAP). 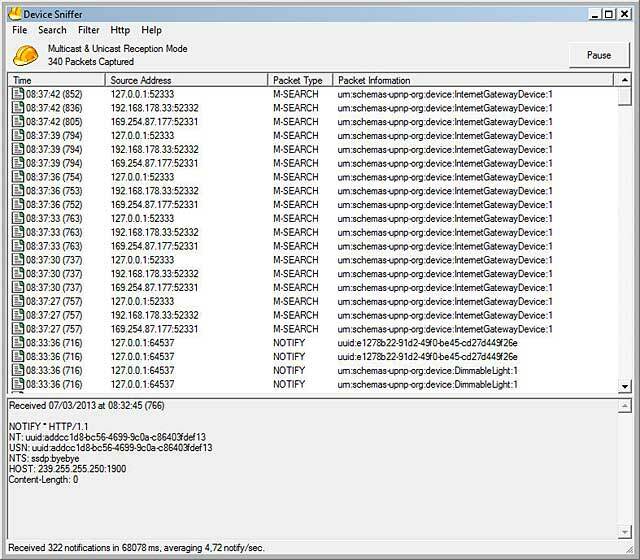 An additional capability of UPnP networking is event notification, or eventing. The event notification protocol defined in the UPnP Device Architecture is known as General Event Notification Architecture (GENA). The final step in UPnP networking is presentation, usually by providing an URL of a webpage loaded in a browser. UPnP AV is an audio and video extension of UPnP, referenced in specifications published by other organizations, including the Digital Living Network Alliance (DLNA). Problems with UPnP are lack of authentication and vulnerabilities with the risk that UPnP devices can be accessed and/or manipulated by malicious web sites. 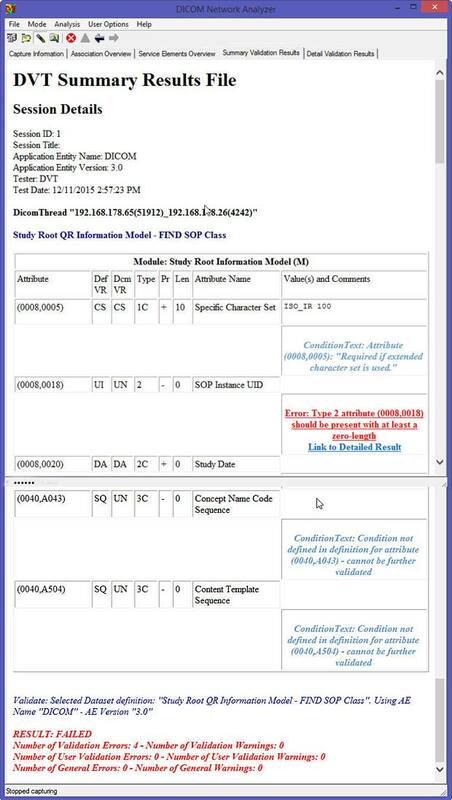 Another UPnP test tool, called UPnP Inspector, has been developed by Coherence. 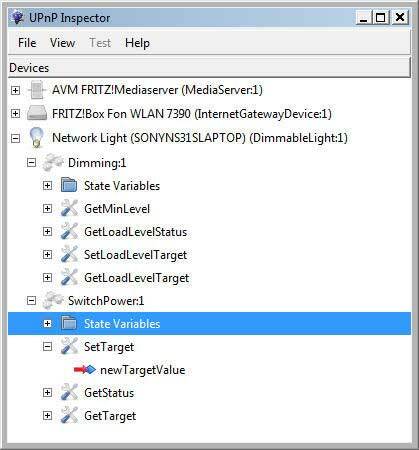 The Inspector is an UPnP Device and Service analyzer, and a debugging tool, based on the Coherence DLNA/UPnP framework. 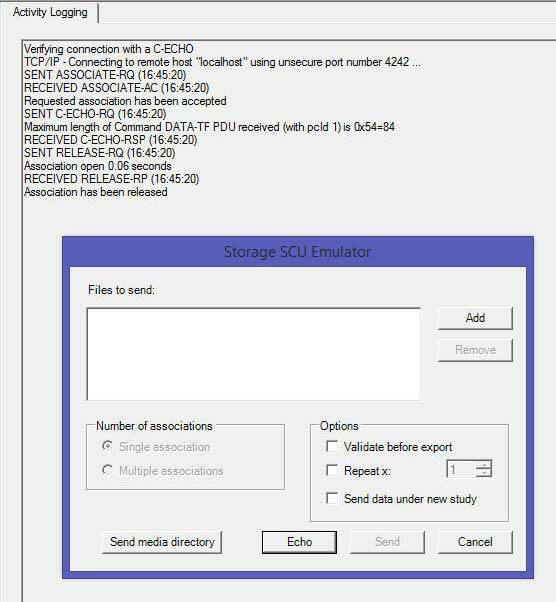 It is loosely modeled after the Intel UPnP Device Spy and Device Validator. A Direct-attached storage (DAS) is a file-level computer data storage system directly attached to a server or workstation, without a storage network in between. The main protocols used for DAS connections are ATA, SATA, eSATA, SCSI, SAS, and Fibre Channel. A storage area network (SAN) is a dedicated network that provides access to consolidated, block level data storage. A SAN does not provide file abstraction, only block-level operations. A Redundant array of independent disks (RAID) is a storage technology that combines multiple disk drive components into a logical unit. Data is distributed across the drives in one of several ways called RAID levels, depending on what level of redundancy and what performance is required. In RAID 1, data is written identically to two drives, thereby producing a mirrored set. A Network-attached storage (NAS) is a file-level computer data storage system connected to a computer network, providing data access to a heterogeneous group of clients. A NAS, in contrast to a SAN, uses file-based network sharing protocols such as NFS, SMB, CIFS or AFP. NAS systems are networked appliances which contain one or more hard drives, often arranged into logical, redundant storage containers or RAID arrays. The benefits of network-attached storage, compared to file servers, include faster data access, easier administration, and simple configuration. The storage space can be comprised of USB or hard disk drives. A NAS can be sold with the drives included or without them. Like PCs, NAS units have memory and processors. With better processors and increased memory, you get better performance from a NAS, just as with PCs. Lunix is usually used as embedded operating system. Noise and security are two other important concerns. A list of additional media servers and client applications is available on Wikipedia which provides also a comparisons of UPnP AV media servers. Apple developed its own proprietary streaming protocol stack/suite, called AirPlay, that is not compliant with DLNA. Another solution to stream multimedia files is based on the SMB/CIFS networking protocols, re-implementated with Samba to open windows to a wider world. I recommend the Serviio DLNA server which I installed a week ago on my two Windows 7 desktops to replace Windows Media Players. In the past the media server components, now integrated in the WMP, were called Windows Media Connect (WMV) or Home Media Ecosystem (HME). The Windows Media Center (WMC) includes a digital video recorder. Late April 2012 I set up a DLNA system in my home network with a Fritz!Box Media Server and two Windows Media Players 12 running on Windows 7 personal computers. Six weeks later I replaced the Windows Media Player system by the outstanding Serviio DLNA server. I disabled the Windows 7 Media Player Network Sharing Service (wmpnetwk) to avoid conflicts in media sharing and to speed up the system’s perfomance. A tutorial how to turn off wmpnetwk.exe is available on numerous websites. The Digital Living Network Alliance (DLNA) allows consumers to connect and enjoy their music, videos and photos from any consumer device (computers, printers, cameras, cell phones, and other multimedia devices) from anywhere in their homes. DLNA (website : dlna.org) is a non-profit collaborative trade organization established by Sony in June 2003, that is responsible for defining interoperability guidelines to enable sharing of digital media between these devices . The private guidelines are built upon existing public standards and specify a set of restricted ways of using the standards in order to achieve interoperability. Today there are 26 promoter members and 199 contributor members. In early 2011, DLNA began a Software Certification program in order to make it easier for consumers to share their digital media across a broader range of products. Today there are over nine thousand products on the market that are DLNA certified. Examples for DMS include personal computers or network-attached storage (NAS) devices. All DLNA devices can be mobile (wireless). Bridges between mobile handheld device network connectivity and home network connectivity are provided by Mobile Network Connectivity Functions (M-NCF). Content transformations between required media formats for home network and mobile handheld devices iare provided by Media Interoperability Units (MIU). DLNA is a refinement of UPnP, a set of rules and restrictions in the name of interoperability. Full DLNA specifications are available only to DLNA members who pay for. 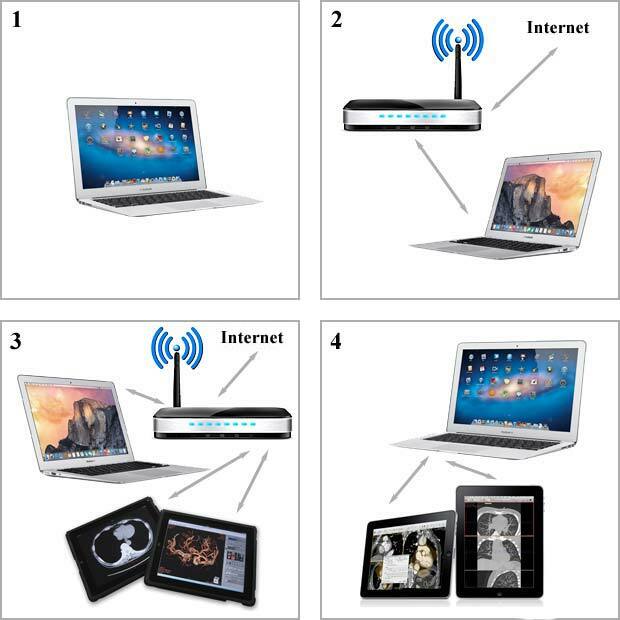 UPnP specifies the abstract device interfaces, the specifications for UPnP are available at the UPnP forum.